The Milky Way, approximately 100,000 light years in diameter, is our galaxy containing the solar system along with billions of stars and other planets. 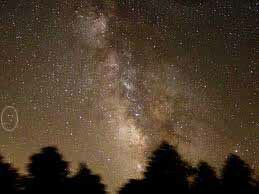 It can be seen as a broad band of faint light in the night sky. The Milky way was formed about 14 billion years ago. It is a spiral galaxy with a large concentration of stars in its nucleus. Stars, dust, and gas fan out from the thick center of the Galaxy in long spiraling arms. Our solar system is located on one of these spiral arms, about 26,000 light years from the center of the galaxy. All objects in the Galaxy revolve around the Galaxy's center and it takes 250 million years for our Sun to pull us through one revolution around the center of the Milky Way. The Milky Way is part of a galaxy cluster that includes 30 other galaxies, the closest of which is the Andromeda Nebula. The Andromeda Nebula is a galaxy visible to the naked eye on a very clear night as a faint fuzzy area in the Andromeda constellation . This is a time-exposure photo of the Milky Way to show it more clearly. It can be seen with the naked eye, if you get away from the city lights, as a concentrated band of stars. The stars aren't really close together, but our vantage point is that of looking through the edge of the galaxy. Coincidentally, Herman's Cross, highlighted, appears in this photo. The nearest star to us is Proxima Centauri at a distance of 4.2 light-years in the constellation of Centaurus. It is a red dwarf star (a relatively low temperature star about 40% the mass of the Sun). Red dwarf stars make up the bulk of our galaxy and are thought to be the most common type of star in our Universe. Our Sun is known as a yellow star as it burns hotter than a red dwarf star.